5 BRDC Superstars attended a ‘Get Race Fit’ seminar at the Porsche Human Performance Centre based at Silverstone on Saturday 23 January. Andy Meyrick, Adam Christodoulou, Riki Christodoulou, Jason Moore and Dean Stoneman joined the PHPC team for a day of physiological testing, training and seminars. 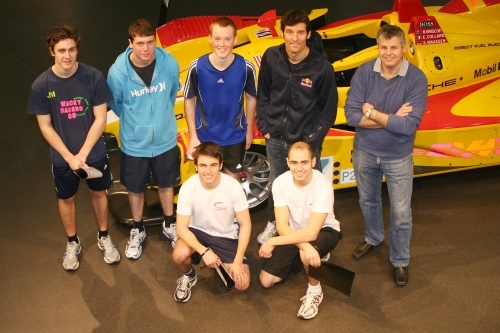 With Red Bull Formula 1 driver Mark Webber and 125cc Moto GP rider Bradley Smith on hand to advise, the Superstars took part in both practical and theory based activities. The morning’s practical testing comprised Body Composition Analysis in the lab, a very impressive Lactate Threshold Testing demonstration by Bradley Smith, Strength Assessments and Movement Screening and a Vision and Reaction Assessment. Following lunch and an opportunity to chat with Mark and Bradley, the Superstars spent the afternoon in the classroom! A comprehensive presentation by the PHPC team was aimed at preparing the drivers’ overall conditioning during the year. The aspects covered included Periodisation, Progressive Overload, Aerobic Training, Strength Training, Mobility and Flexibility and Recovery. This most useful address gave the Superstars a platform to work from during the year and a better understanding of how to manage their training. An interesting Q & A session with Mark Webber ended a highly positive and instructional day for the Superstars.